Ace Blog: Play the 24Ace 'Video Poker' online game for free! Play the 24Ace 'Video Poker' online game for free! Play a free game of online poker, with 24Ace's 'Video Poker' ! Can you beat the dealer, and get yourself on the high score table? 1) Place your bet by clicking on the chips. 2) Deal by clicking the Deal button. 3) Choose which cards you want to keep by clicking the HOLD button underneath the cards. If you are dealt a winning hand straight away, those cards will be automatically held. 4) Replace the winning cards you don't want by clicking deal again. If a winning hand comes up then you're in the money! 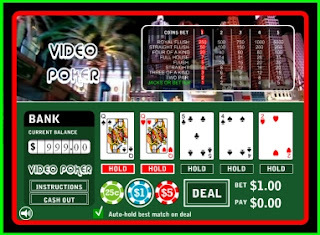 Click here to play 'Video Poker' !